I made Lavash Crackers from Peter Reinhart's book, The Bread Baker's Apprentice. Followed his relatively simple recipe, resulting in this "snappy Armenian-style crackers, perfect for breadbaskets, company and kids". Needless to say, my daughter was instantly hooked on to it and the cracker ended up being her dinner...almost. I had to bribe her so she would save some for snacktime tomorrow. Served it with this colorful chunky salsa. The key to making a yummy salsa that not only tastes good but also looks good is to make sure the ingredients are all chopped up to almost same sizes. Adjust the level of sweetness/sourness/spicyness to your liking. You may not have to add sugar at all, if the fruits are sweet enough. 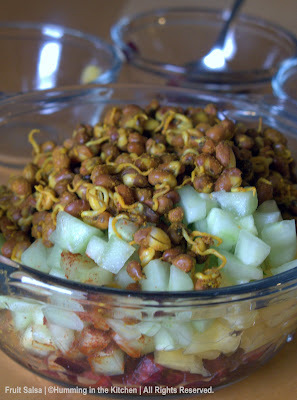 Sprinkle the salt and turmeric powder on the sprouted beans, shake well to coat. Steam the sprouted beans for 8 to 10 minutes; I usually use my idli plate for all steaming purposes. Remove the steamed beans to a flat plate, allow to cool. Add the cooled beans, the chopped up fruits, cucumber, lemon juice and seasonings to a mixing bowl and toss to mix well and to distribute evenly. Check for salt/sugar/spicyness. Chill for at least half an hour before serving. While the salsa chills in the refrigerator, proceed to bake the crackers. In order to do this, you should have the lavash dough kneaded and fermented, waiting to be baked. Unbleached bread flour - 1 & 1/2 cups (6.75 ounces) - I used King Arthur's Unbleached bread flour. The recipe called for 1/3 to 1/2 cup of water but I had to use 2 additional tablespoons for the dough to come together. I am guessing this must be due to the difference in measuring a cup. If I had weighed the flour to be an exact 6.75 ounces, the amount of water that the recipe called for would probably have been sufficient. The key to crisp lavash, according to Peter, is to roll out the dough paper thin. The method to make Lavash is mostly as described in Peter's book. I have only altered it very slightly. In a mixing bowl, stir together the flour, salt, yeast, honey, oil and just enough water to bring everything together into a ball. Knead for about 10 minutes, or until the ingredients are evenly distributed. The dough should pass the windowpane test. It is a simple test to make sure the gluten formation is sufficient. It took me about 12 to 13 minutes of kneading to pass the windowpane test. The website sourdoughhome.com has detailed information of the windowpane test. Click here to read it. Towards the bottom of the page, the concept is clearly explained. Ferment at room temparature for 90 minutes. Or alternatively, mist some oil on the kneaded dough, cover it with plastic foil so the foil is in contact with the dough, leave it in the refrigerator overnight. If you are following the second method, leave it in the fridge immediately after kneading. (This is what I did - I mixed it the night before and left it in the fridge. About 2 hours before baking, I took it out of the fridge and left it covered, on the countertop). When you are ready to bake, divide the dough into two halves and press the first half into a square with your hand and dust the top of the dough lightly with flour. Roll it out with a rolling pin into a paper thin sheet. You may have to stop from time to time so the gluten can relax. At these times, lift the dough from the counter and wave it a little, then lay it back down. Cut the rolled out dough into diamond shaped crackers with a pizza cutter, transfer to a cookie sheet lined with parchment paper. Bake for 15 to 20 minutes. The crackers were done at exactly 15 minutes. Half way into the baking cycle, I turned the crackers upside down once. This way they would be evenly browned on both sides. 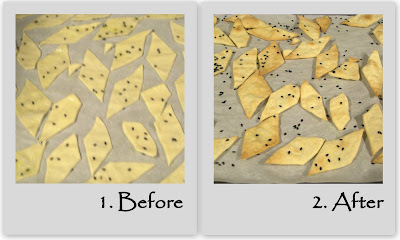 Remove the baking sheet from the oven, remove the crackers to a plate to cool. Proceed with the second half of dough. 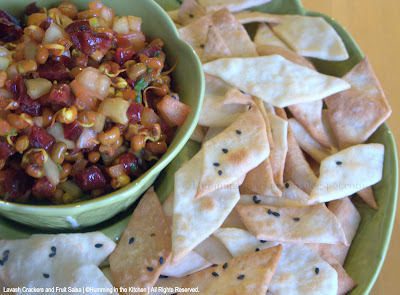 These crunchy crackers were perfect to be enjoyed with the chunky sweet, savoury, sour and mildly spiced salsa with sprouted beans & chopped up seasonal fruits. 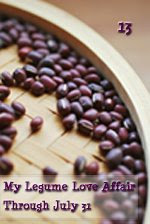 This chunky sprouted bean salsa goes to My Legume Love affair - 13th Helping, conceptualized by Susan and hosted by SunshineMom, of TongueTicklers. For Susan's original announcement with the host lineup, click here. 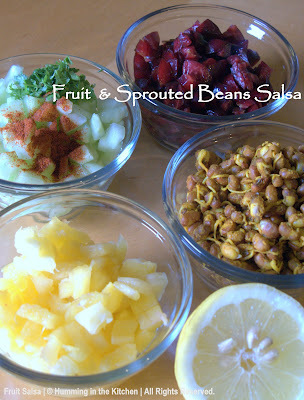 The fruit & bean salsa is my own original creation, so I am also sending it to the Original recipes round up #14 hosted by Lore. I am also sending it to Susan's YeastSpotting. Thanks a bunch Sadhana & Muskan. Very nice and delicious dish. Salsa gets an A+. Send your crackers to Susan's yeast spotting also. Wow..that was a great post..Love to have some..tempting salsa..
Hey thats an amazing combo! I just loves these kind of salsas. The crackers are also amazing. Will try those crackers soon. 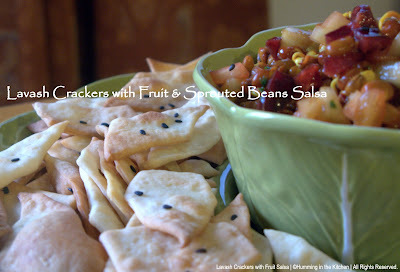 The crackers make a great accompaniment to the fruit salsa. first time here vidya.i love the way u have titled ur blog. so simple yet so nice. hoping to hop over to ur space often. What a healthy snack you created. Your daughter is a lucky gal. Perfect crackers. They're the kind of snack I like - savoury and crunchy! Both the crackers and the salsa look fantastic! Thanks for sending them to YeastSpotting. Wow, what a creative and vibrant salsa, I'd love to give it a taste! 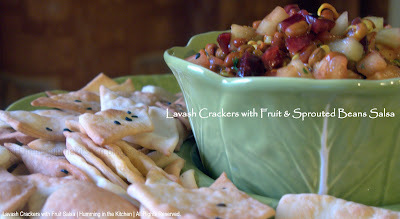 And paired with these crackers it makes such a great snack. Healthy and happy taste buds too :). Thank you for sharing your delicious recipe with the Original Recipes Round-Up. Vidya, those crackers look very good. Though I'm wondering if this qualifies for the whole wheat event. Could you please clarify if you have used whole wheat flour or bread flour. Bread flour is made from the endosperm of hard wheat. To qualify as whole grain/wheat the flour should contain the bran, germ and endosperm. Thanks. Welcome to my humming, happy kitchen. I really appreciate your input. Thanks for stopping by!